With a stay at Holiday Inn At the Pavilion in Myrtle Beach (Downtown Myrtle Beach), you'll be steps from SkyWheel Myrtle Beach and Myrtle Beach Boardwalk. This beach hotel is 0.5 mi (0.8 km) from Myrtle Beach Room Escape and 1.3 mi (2 km) from Family Kingdom Amusement Park. Make yourself at home in one of the 138 air-conditioned rooms featuring microwaves. Rooms have private balconies. Complimentary wireless Internet access keeps you connected, and cable programming is available for your entertainment. Bathrooms have complimentary toiletries and hair dryers. Don't miss out on the many recreational opportunities, including an outdoor pool, an indoor pool, and a lazy river. Additional features at this hotel include complimentary wireless Internet access, a picnic area, and barbecue grills. Wrap up your day with a drink at the poolside bar. For your convenience, a complimentary breakfast is served daily from 7:00 AM to 10:00 AM. 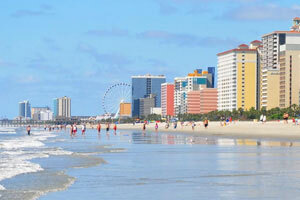 The preferred airport for Holiday Inn At the Pavilion is Myrtle Beach, SC (MYR). The Lowrise guestrooms at this property require the use of stairs and are not accessible to wheelchairs at this time. For more details, please contact the property using the information on the reservation confirmation received after booking. This property requires all guests under age 21 to share accommodations with a parent or legal guardian. For more details, please contact the office using the information on the reservation confirmation received after booking.